Cobb & Co 2 is a spacious one bedroom lakefront apartment. Perfect for couples or family of 4 to getaway to the mountains. 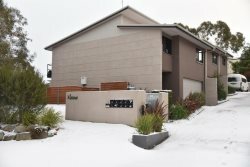 The apartment is located in a quite part of Jindabyne. Just across the road from Lake Jindabyne. You can enjoy a swim during the warmer months in the crystal clear mountain fed lake. Also you have the advantage of being within 1 minute to the start of the Jindabyne shared trail. A 10 kilometer mountain bike/hiking trail which winds its way across the dam wall towards east Jindabyne. Inside, your kitchen outfitted with all your holiday appliances including refrigerator and stove, offers the cook every thing they should require. The dinning area is located next to the open plan kitchen and living area. The property has a private courtyard located through sliding glass doors from the dinning area. A comfortable sofa invites you to enjoy a movie after a day in the mountains or watch your favorite game on the large, flat screen television. The bedroom, with its own en-suite and spa bath, provide's the perfect accommodation for a couple with its queen sized luxury bed. If you do have extra guests there is a queen fold down bed located in the corner of the lounge area. Although you’ll feel miles away with the Lake at your doorstep, you’re just a short 20 minute stroll to the restaurants, shops and galleries of Jindabyne. You can browse the ski shops and book a tour or lessons in both winter or summer months. Your vehicle is accommodated in the undercover car park located off street. There is No WiFi available but you can order 22gb of Telstra 4G Broadband with our mobile modem or alternatively use your own data allowance. Year Round Bike Rentals? Click below for details. Superior Linen supplied including large soft bath sheets. Pleasant and practical. I noted the fittings and fixtures are generally cheap. Who offers a VHS as entertainment in 2018! Retro! I had fun explaining to my son what it was At ~$500/night cant owners invest in some modern touches so it feels like better value for money? Ray White staff and Larry Adler experience were very good. Thanks you. Peter and Joan were great with communication leading up to the stay. The place is great located centrally in Jindabyne and across from the lake. Would stay again! Great weekend,really enhanced by the cosy and well equipped apartment! Peterand the team went above and beyond what was expected from a holiday rental. Personal and helpful touches made it very enjoyable and easy experience! Great apartment, really comfortable,well equipped and great location. Great stay! We'd love to come back! We met Joan upon arriving and leaving and she seems very lovely and was very nice to communicate with. We arrived about 20 minutes later than expected, but Joan was very nice about everything and made checking in and out a breeze.Thank you to Joan and Peter for being lovely hosts and we would not hesitate to book with you again. The apartment was very cute to stay in, we parked on the street right in front of the building rather than the back, which made everything very efficient. We had the lake directly in front of us and if we had time we would have gone for a walk along the lakes edge, it was a very beautiful place. The apartment itself was very comfortable, the heaters made it very warm and everything was kept very clean. It was an easy 30 to 40 minute drive up to Perisher and very close to town. Overall, it was a comfortable stay for 4 adults and a lovely vacation spot. I found Joan and Peter to be exceptional hosts. They called and emailed when promised and even had the unit toasty warm for our arrival after a long trip. I cannot think of anyone who provides better service. Cobb & Co is a lovely little unit. It is very cosy and well stocked with linen, kitchen, pantry items and even DVDs and videos to fill in those free hours. The addition of a second panel heater makes it warm and toasty in winter and if it snows (like it did for us), the snow on the grass seems to linger a little longer in the front of this unit. So it must be special!